Speedway Shelters currently ship free to the lower 48! Get yours today before free shipping ends. 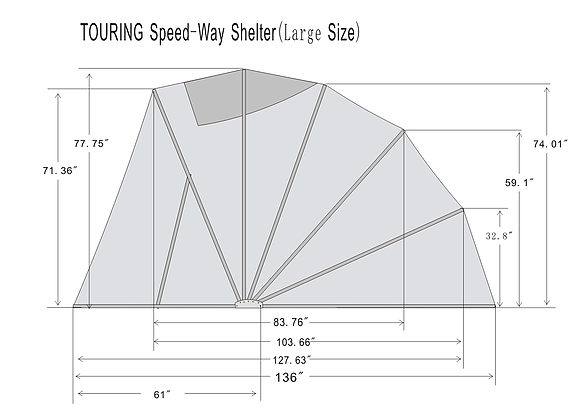 ​The Speed-Way shelter is an enclosed motorcycle cover manufactured by a team of experienced and dedicated professionals. These durable, motorcycle covers provide shelter for all cycles, bicycles, electric bikes, boats, golf carts, ATVs and more. 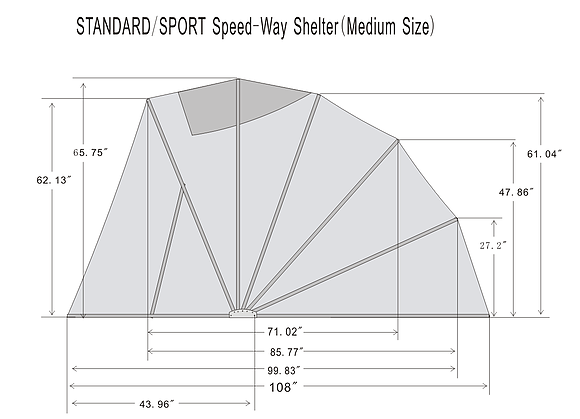 Be ready for all weather conditions, call us today at 1-724-992-8431 to order your Speed-Way motorcycle cover. We ship internationally. 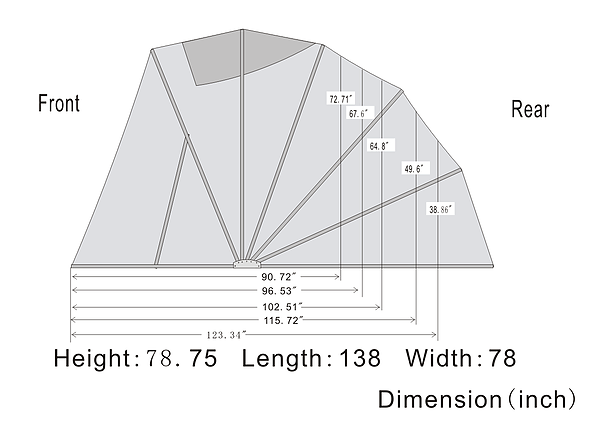 The Newly Designed Standard/Sport Model Retractable Motorcycle Cover/Shelter is compact (43W x 108L x 64H) and fits most Motorcycles with low or no Windshields, as well as Scooters, Bicycles, Riding Lawn Mowers and More! 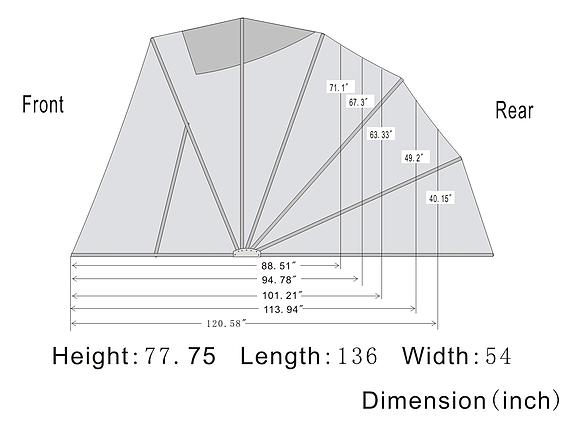 ​This Shelter weighs 61 LBS includes a Sturdy Steel Square Tube Designed Internal Frame, an Interior Light and rugged Carry Bag for portable use. It is fully Retractable, Waterproof, and features a Lockable Mechanism for added security. Other features include Open and Close Windows for air flow ventilation in all climates. With no tools needed this fast and easy set-up is great for indoor or outdoor use. 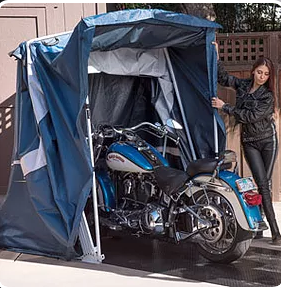 ​This Retractable Motorcycle Cover/Shelter Deluxe Luxury Model (54W x 136L x 76H) fits any full dress Touring Motorcycle including the largest touring Harleys and Goldwings as well as many ATVs. Weighs 72 Lbs with sturdy construction providing everything you need to protect your ride, indoors or outdoors, in all weather conditions. Interior light is included for night time convenience. The heavy duty carry bag allows you to pack the Shelter in your car, truck or RV, making the motorcycle cover easily portable. This Shelter allows for some extra room to store riding gear, is waterproof, with lockable features, and ready for use in just 25-30 minutes or less (set-up time). Retractable Motorcycle Cover Deluxe Luxury Model (54W x 136L x 76H) fits any full dress Touring Motorcycle including the largest touring Harleys and Goldwings as well as many ATVs. This Retractable Motorcycle Cover/Shelter Deluxe Luxury Model (54W x 136L x 76H) fits any full dress Touring Motorcycle including the largest touring Harleys and Goldwings as well as many ATVs. Weighs 72 Lbs with sturdy construction providing everything you need to protect your ride, indoors or outdoors, in all weather conditions. Interior light is included for night time convenience. The heavy duty carry bag allows you to pack the Shelter in your car, truck or RV, making the motorcycle cover easily portable. This Shelter allows for some extra room to store riding gear, is waterproof, with lockable features, and ready for use in just 25-30 minutes or less (set-up time). 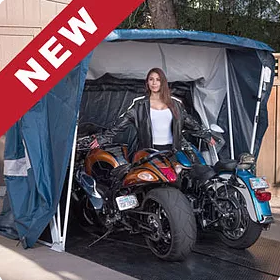 This New Deluxe Model Retractable Motorcycle Cover/Shelter (79W x 138L x 79H) fits any two Sport Size Motorcycles or any single Full Dress Touring Motorcycles, Trikes including many ATVs and Can-Am Motorsport Vehicles.Weighs 82LBS. with Sturdy Square Tube Designed Frame Construction providing everything you need to protect your ride, indoors or outdoors, in all weather conditions. 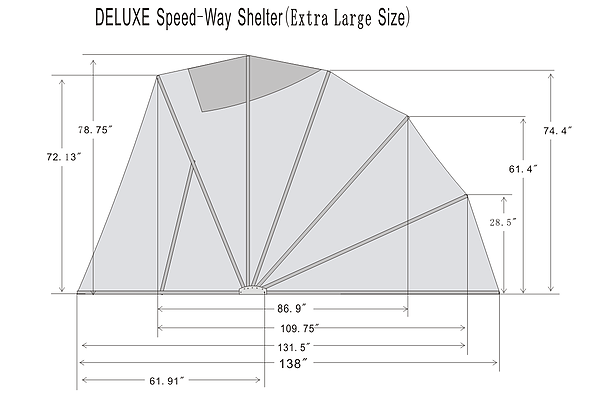 Works well with the Touring Shelter or the Standard / Sport Shelter. With its high impact, high density and abrasion resistant rubber this floor easily rolls out protecting your cycle by preventing water from pooling, condensation build-up and dust from entering the shelter. This durable High Density Floor will also protect your sub-floor from any oils or solvents. Sewn-in Velcro bottom allows for a sealed enclosure motorcycle cover. Side Tie-Down Attachments sewn into each side of the fabric cover for added support in the event of high wind. Built-In Locking Hardware allows the Speed-Way motorcycle cover to be locked in the lowered position. Includes a custom Speed-Way Carry Bag for storage or other use. Includes a 48 lamp LED Bright Light with 3 operating functions. Helpful for night parking or general night access. Multi-Treatment Fabric (High density Polyester often used on luggage) for best all weather performance PU & PVC water protection along with full UV treatment for Sun Protection. All interior seams are Taped or “Welded” which fully seals the seams to prevent any water, dust or anything from entering the Speed-Way Shelter. This is a process used for expedition 4 season camping tents and it is for high value products only due to the process expense. Best Ventilation of any Shelter thanks to the correctly adjusted window size for the cubic area of the Shelter and our testing process with heated motorcycles. 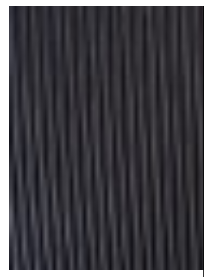 We have also included complete perimeter sewn Velcro around both Large windows to control the ventilation and provide full closure in bad weather conditions. small windows / without full sealed closure feature. No Tools Required / Faster Set-Up (Durable Spring-Clip assembly system) Designed in USA. tools are required if the frame is as structurally sound as ours. Two sizes! This is an advantage as it uses only the space that your bike actually requires. Two Guy Rope straps on each side for securing the tent to the ground in very high wind. New! Sewn-in Splash Guard protects your bike from dust, moisture, and rain from blowing or splashing into the Speed-Way Shelter. 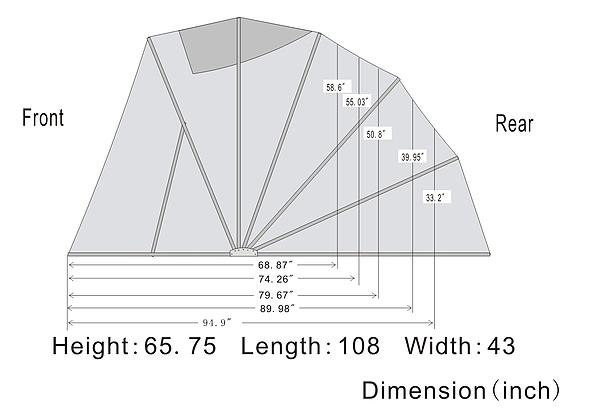 This is a extended piece of fabric that is attached all of the way around your Speed-Way Shelter and lays on the ground to provide sealed coverage around your Shelter and more importantly your cycle. 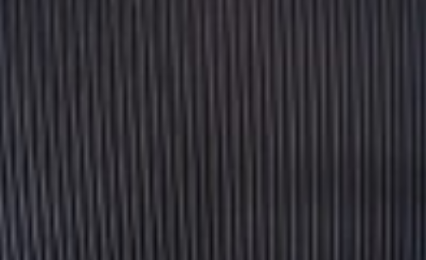 High density, high impact and abrasive resistant flooring is available separately. This material is very durable and necessary for this use. Durable 2-post alignment Locking hardware Welded to the frame.